Soil Amendments | Soil Service, Inc.
After a very dry summer, we have been getting some moisture in the form of rain for the last 2-3 weeks. Very welcome, even if it did slow harvest a little. On October 23, we finally harvested the Soil Health Study Field. We were pleasantly surprised with the results. First, the whole 30-acre field missed averaging 60 bpa by just a few pounds across the scale at the elevator. 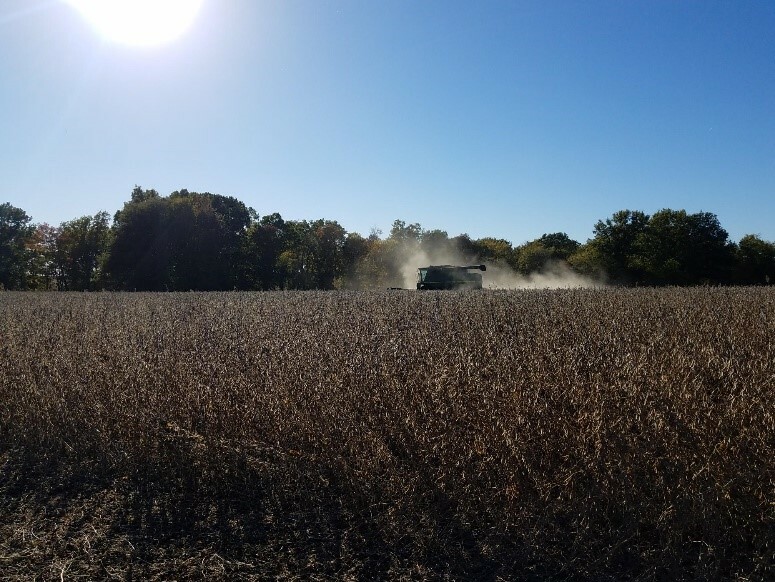 The other fields of soybeans that we have been combining were only averaging 40-45 bpa. As I have talked about in previous blogs, this field has been managed, since 2012, to improve soil health. We have been using the SOIL Service Nutrient Recycling Program, cover crops, and either no-till or the Aerway each year. The NRP was applied the previous three years before this year. Last year we had a very good corn crop on this field, under good growing conditions. This year, because of the improved soil health, we had a very good bean yield despite of the extremely dry conditions. One of things that I did test in t his field this year was the use of 3-18-18-1, including 1 pint per acre of Sugar E-Boost as a starter for the beans. I compared it to using only 3-18-18-1. 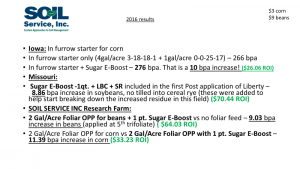 Once again, just like on the corn, there was a 3 bushel per acre yield increase. 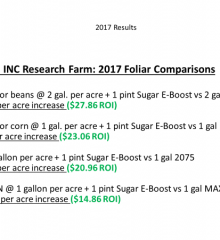 If you are wondering, at the current local cash price ($7.55) and using the 2×2.5-gallon jug price of 95 cents per acre, that is a $22.70 ROI, just by adding 1 pint per acre of Sugar E-Boost to the starter. Using Sugar E-Boost with any starter program, and or foliar program, is going to be standard for us from now on. 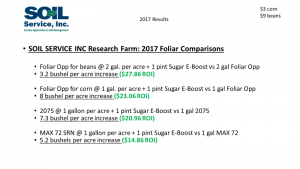 Here are comparisons that we have compiled from the previous two years using SUGAR E-BOOST when foliar feeding. The ROI is impressive! For a 94 cent per acre investment, you could include SUGAR E-BOOST with your herbicide application. SUGAR E-BOOST provides energy to the plants aiding in making the plant stronger and healthier. This will help the corn and/or soybean plants cope with stress. Call or email us to get more information, or to order some today! At a recent conference I attended, one of the presenters made the statement that it doesn’t pay to apply micro nutrients. This isn’t the first time I’ve heard this statement and most likely won’t be the last. Not only are micro nutrients crucial to plant growth, in certain cases a micronutrient deficiency could be the most limiting nutrient. Think of a micro nutrient as a spark plug in an engine. It’s the catalyzing agent that makes plant process’s go. Sense they act as catalyzing agents (or signals that stimulate plant process’s and ultimately growth) they are needed in smaller amounts then major or secondary nutrients. Hence why they don’t get the attention they need. The micronutrients to pay closest attention are zinc, boron, manganese, copper, iron, and molybdenum. At Soil Service we offer all essential micro nutrients to fit your nutrient needs. We also offer our Foliar Opp foliar fertilizer for both corn, soybeans, and alfalfa to provide both major and micro nutrients in season at key growth stages. Here are 12 key points to remember about micro nutrients and their application: 1. 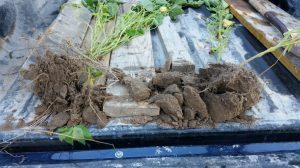 Micronutrients can be more limiting in cooler wetter soils early in the season. 2. Having the proper amounts of major, secondary, and micro nutrients is crucial early on in corn when ear size is being determined. 3. Phosphorus and zinc must be in the proper relationship with each other to optimize uptake and utilization. This is why we recommend 1 quart of EDTA chelated zinc in our starter blends. 4. Boron is important in grain fill and nitrogen movement and utilization. 5. Proper levels of boron and copper help fight rust and fungus diseases. 6. Grain test weight can be greatly influenced by proper micronutrient levels. 7. Molybdenum helps nitrogen fixation in legumes. 8. Manganese helps with germination and emergence of young seedlings. 9. Manganese and boron aids in flower and seed set as well as flower retention in soybeans. 10. Implementing an NPK fertilizer with your micronutrients helps with the intake and movement of micronutrients throughout the plant. Our Foliar Opp contains our 3-18-18-1 starter fertilizer plus micronutrients to fit this need. 11. Our Soil Boost Plus helps with the utilization of foliar applied micronutrients with its intake and translocation agents. This product also has pH lowering esters that provides a solution more curtailed to the plants liking. 12. Always make sure you have plenty of nitrogen, phosphorus, potassium, sulfur, calcium, and magnesium before you focus heavily on micro nutrients. Rely on our team at Soil Service to help you customize plans for your soil and plant nutrient needs. Our goal here is help you maximize production and most importantly your profitability. As always thank you for your support of our services and products. Do the larger root systems on the plants on the right of the picture below peak your interest? I decided to go into the Soil Health Study field and dig some plants up last Tuesday. 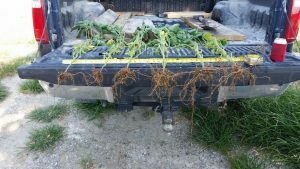 I also went to an adjoining field that has not received the Nutrient Recycling Program, but has had cover crops, to see what our soybean root systems looked like. Pleasant surprise! Not only were the roots more robust, but so were the plants themselves. The stalks were larger and there is an average of ten more pods per plant in the study field. This will translate to more yield this fall. Soil tilth was better, too! I dug three plants each field, and was very careful to try and keep the soil intact. The soil in the SOIL HEALTH STUDY FIELD was extremely loose and very tilthy, I couldn’t hold it together to carry out of the field. It was no problem with the other non-treated field. It’s no wonder that the roots systems are bigger, it’s easier for them to expand in the healthier soil. This soil will also hold more water during the drier stress times of the growing season. Some think it was because we had such a mild winter—that the freezing and thawing did not get rid of some shallow compaction. Others think it was because some growers cut fertility programs to save on costs this spring. Still others think it was just a function of the cooler, wetter spell after such good planting conditions and early corn planting. No matter what the cause is, none of us like to see uneven corn in our fields. 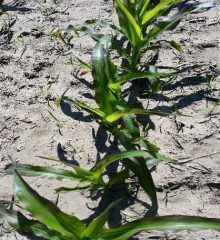 Some of the tissue tests I have run have shown that the corn (and soil) could have used some extra P & K. Others have shown that both the soil and the corn are very low in sulfur. None had used our Crop Choice® starter program. With our program, your fertility program for next year can be tailored to suit your farm, even field by field, with both a starter recommendation and a soil recommendation. When harvest gets here, it’s a great time to start soil sampling for 2017! As far as the soil biology is concerned, we have the Nutrient Recycling Program (NRP) to help you increase your soil mycorrhiza and other beneficial soil bacteria. 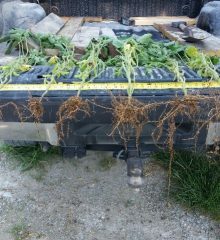 We are using the Nutrapathic™ Soil Restore and Nutrapathic™ Liquid Bacteria Concentrate, along with Sugar E-Boost® (two of the NRP’s components) when spraying post-emergent herbicides on no-till beans this year where there is a heavy mat of residue. Not only are we hoping to see a faster breakdown in the residue, we are making sure our soil health is moving in the right direction so as not to have stunted corn. If you have questions about what has been going on in your field this spring and summer, or want to find out more about any of our programs, you can contact me or browse our website. Mark your calendar to attend one of our field day sessions Aug. 17 or 18 at the Niota, IL, research farm.